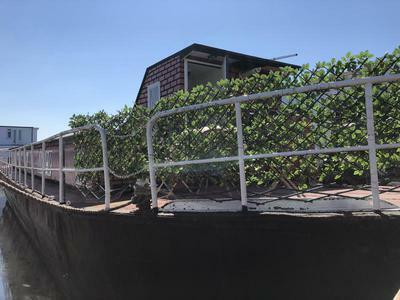 Premier Houseboats are pleased to present Toad Hall, a well presented static houseboat ready to move into, offering good living space at an affordable price. Toad Hall has been recently refurbished inside, and the exterior has also been painted. As well as a spacious and light interior, there is also plenty of usable outside space to enjoy the peaceful surroundings. The main roof has also recently been repaired and re felted. Accommodation includes a good sized kitchen, with plenty of storage space and work surface, together with a gas oven, fridge, freezer and washing machine. There is a service hatch opening to the lounge area. The large, open lounge diner is nicely decorated, and has plenty of windows that offer good light. There is one family bathroom, housing a bath with shower attachment, hand basin and toilet. There are two excellent sized double cabins, both again light and well decorated, and both with built in storage. . There is gas central heating throughout the boat, together with a new gas combi boiler from 2016. The hull was surveyed in 2015 and found to be in very good order, there is access throughout the boat to the hull from the inside.The accommodation is all on one level which makes it easy to maintain and move around. Toad hall offers great usable space, both internal and external. An excellent example of an affordable family home, benefiting from secure surroundings with some lovely views. Vessel name: Toad Hall Vessel condition: good Year constructed: 1958 Berths: 4 Cabins: 2 Heads: 1 Length over all: 84' Beam: 18' Maximum draft: 2' Hull material: Steel Hull type: Flat Hull colour: black Displacement: 65 tons Disclaimer Premier Houseboats offers the details of this advert in good faith as it was presented by the seller or his representative but cannot guarantee or warrant the accuracy of this information nor warrant the condition of the described item within this advert. A buyer should instruct his agents, or his surveyors, to investigate such details as the buyer desires validated. The Item described within this advert is offered subject to prior sale, price change, or withdrawal without notice.